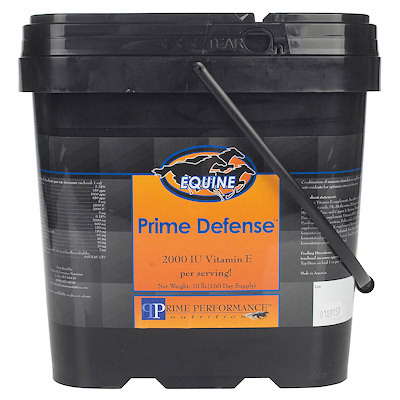 Prime Defense Vitamin E (Prime Performance) mini pellets is a combination of Immune Stimulators and Free Radical Scavengers, Anti-oxidents including Vitamin E for Optimum Stress Tolerence. Ideal for horses under heavy stress, allergies, EPM and tying up syndrome. Prime Defense Vitamin E also contains high levels of Copper, Zinc, Manganese, Cobalt, Vitamin D3, Vitamin K, Magnesium, Ascorbic Acid, Niacin, Thiamine, D-Pantothenic Acid, Riboflavin, Folic Acid and a very high level of Lacbocillus acidophilus(Probiotic). A 1 ounce measure is included. 10 lb bucket is 160 day supply. Top dress on feed 1 ounce daily.